The Nubia Museum in Aswan is an excellent introduction to the history and culture of the Nubians. It contains a collection of artefacts from Nubia (the region approximately between Aswan and Khartoum in Sudan) and an exhibition of Nubian culture and crafts. 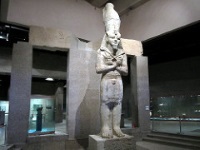 It also portrays the history and people of the Nile Valley from ancient times until the present, and has a hall full of impressive statues and tombstones from the region. One of the most interesting exhibits is that covering the project of UNESCO to move monuments like Abu Simbel, endangered by the High Dam on Lake Nasser, to higher ground. Visitors can get an idea of what the area looked like before the floods and how much effort was put into preserving this endangered ancient culture. At the Nubia Museum you can see weaponry, pottery, jewellery, statues and the ever-popular mummies. The exhibits are well organised and laid out and have good English labels. The museum is well air-conditioned, making it a popular retreat from the heat of the day. It is also open until late, providing a good option for an evening of culture.